Home > News > Southern News > Come-On-Down Coulsdon Town! 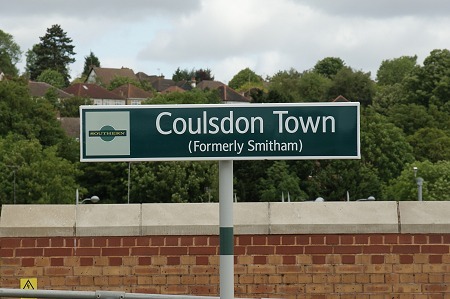 As portended in our item So-Long Smitham, on Sunday 22nd May Smitham station became Couldson Town. Lester Hayes visited on the day to see what changes had been made. For the first time since the new station building came into use the station has been identified from outside, and the new sign carries both 's target and the emblem. 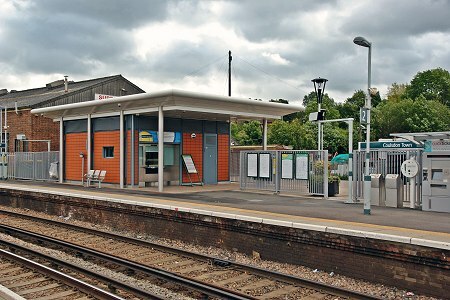 The new station building as seen from platform 1. 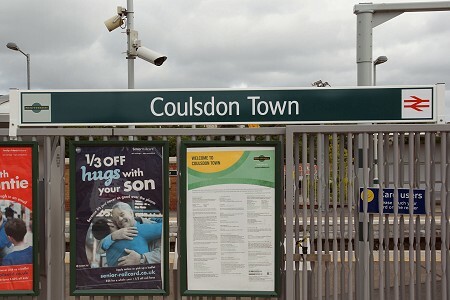 The Coulsdon Town sign seen in this view is the other side of the above. In answer to our musing about whether the old platform signs would be recycled or sold, the answer is they have had vinyls applied over them! This is the same sign as pictured on So-Long Smitham. Note, at least for a bit, they are hedging their bets! Lester reports that at all stations from here to East Croydon the station was correctly announced and displayed. At East Croydon the "fastest train" display in the booking hall has, presumably due to cost considerations, had the Smitham name directly changed to Coulsdon Town so is not shown in alphabetical order. On board the trains, on one Class 455 the PIS did not reflect the change whereas one Class 377/2 and one Class 377/1 sampled had correct announcements (Coulsdon Town) but the dot matrix display was still showing Smitham (Coulsdon Town). So still work in progress! 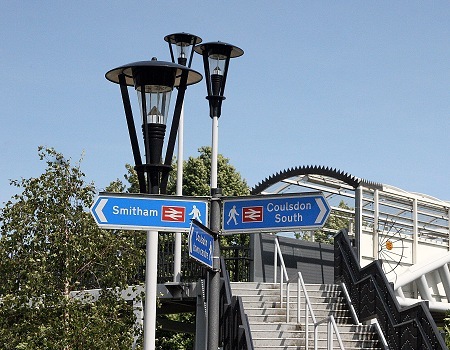 However, noticed on 24th May, the sign by the new footbridge in the vicinity of the former Couldson North station had not been changed.